Construction projects in Fayetteville, Las Vegas and Amarillo will bring three brand new ballparks into the Minors this year. As the 2019 season approaches, three new ballparks are set to open and myriad others will unveil improvements. What follows are updates on the new facilities as well as information regarding notable enhancements to existing ones. Fayetteville's stadium name: On Thursday morning, just before this article was published, the Fayetteville Woodpeckers, in conjunction with the City of Fayetteville, North Carolina, announced the name of their ballpark: Segra Stadium. The Woodpeckers, Class A Advanced affiliate of the Houston Astros, spent the past two seasons in nearby Buies Creek while the ballpark was being built. Segra is one of the largest independent fiber bandwidth companies in the U.S., and the new baseball stadium will be equipped with cutting edge Wi-Fi coverage powered by fiber connectivity that will alow fans to experience "seamless" connectivity during Woodpeckers games. The stadium-name reveal came 10 days after an announcement that the plaza located in front of the facility will be named for the late Bill Hurley. The Fayetteville Observer noted that Hurley, who was elected mayor of the city in 1983, is "remembered for his long-term effort to push out the physical and moral decay that blighted downtown Fayetteville." Segra Stadium will debut on April 18. Last month, the local CBS affiliate reported the stadium will cost $7 million more than its initial $33 million estimate. Deputy city manager Kristoff Bauer said the cost overrun is a result of "significant increases nationwide, especially on concrete and other things of that nature." Welcome to Hodgetown: The Woodpeckers' stadium name unveiling was preceded by that of the Amarillo Sod Poodles, who revealed their ballpark name on Nov. 13: Hodgetown. In a press release, the team said, "'Hodge' recognizes and gives thanks to Jerry Hodge," a local businessman and philanthropist who "spearheaded the effort along with other community leaders to bring affiliated, professional baseball back to Amarillo." The "town" portion of the name, meanwhile, references how prairie dog culture "involves multiple colonies forming one large community." Hodgetown will host its first game on April 8. Earlier this month, a correspondent for Amarillo's NewsChannel 10 toured the in-progress facility and reported that "construction is right on schedule." The Sod Poodles, the Padres' Double-A affiliate, replace the San Antonio Missions in the Texas League. Las Vegas LEDs the way: The Las Vegas Aviators, formerly the 51s, are leaving Cashman Field for Las Vegas Ballpark, located in the nearby planned community of Summerlin. The Howard Hughes Corporation, which owns the team, announced on Feb. 4 that Las Vegas Ballpark will have "the largest Daktronics [brand] scoreboard ... installed in baseball's Minor Leagues and is top 25 in size for baseball in North America." The videoboard, measuring approximately 31 feet high and 126 feet wide, features an LED display "capable of variable content zoning, allowing it to show one large image or be divided into multiple zones to show any combination of dynamic content." Complementing the videoboard will be two "ribbon displays measuring 3.5 feet high by 41 feet wide." Per the Las Vegas Review-Journal, construction is on pace to be completed in time for the Aviators' April 9 opener, although certain elements -- such as the right-field swimming pool and splash pad -- may not be finished. 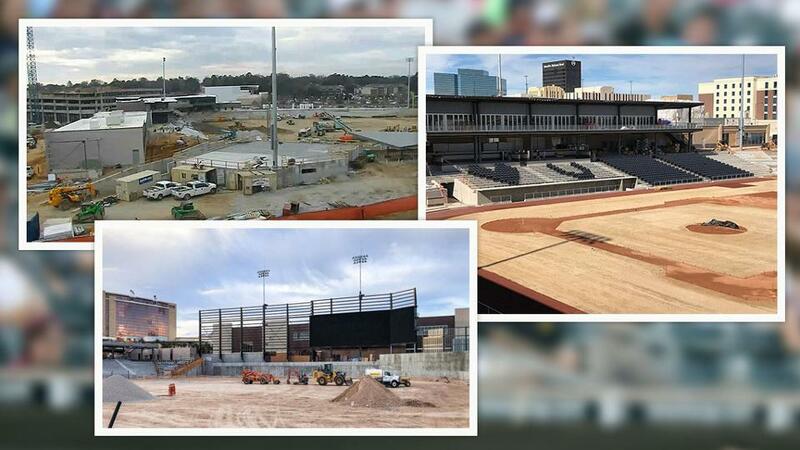 --On Jan. 28, the Oklahoma City Dodgers detailed a slate of enhancements to 21-year-old Chickasaw Bricktown Ballpark. The team said the $2.5 million project is "highlighted by a complete field renovation of the playing surface" as well as a new irrigation system and a new lighting system. --Earlier this offseason -- way back in November, in fact -- the Binghamton Rumble Ponies and New York State representatives unveiled a $5.1 million improvement plan "for major upgrades" at NYSEG Stadium. The plan includes infrastructure upgrades, a renovated home clubhouse and new seats, turf, videoboards, sound system, fencing and netting. NYSEG Stadium has hosted Double-A Eastern League baseball in every season since opening in 1991. --Also in November, a series of improvements were approved for the Bowling Green Hot Rods' home of Bowling Green Ballpark. The Bowling Green Daily News reported, "The upgrades are part of an agreement with new Bowling Green Hot Rods owner Jack Blackstock." Those upgrades include a new videoboard, a reconfigured suite-level space and a completed 360-degree walkway. The Hot Rods said in a press release, "With the walkway completed there will be a new 'Splash Zone' ... behind the center field wall." --After 51 consecutive seasons in the Double-A Texas League, the San Antonio Missions are playing in the Triple-A Pacific Coast League in 2019. This level jump has spurred ballpark improvements. Team president Burl Yarbrough told the San Antonio-Express News, "We're going to add some additional space to the clubhouse and do some renovations. Those are the things a Major League club is most concerned about for their Triple-A affiliate."